1998 was the year when ECDIS got its first attention in a circular of Maritime safety committee of the IMO. 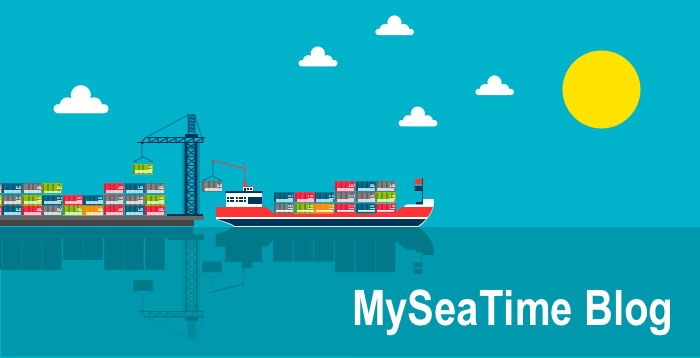 But the mandatory requirement to carry ECDIS onboard ships commenced 2012 onwards. Quit late, I would say but nevertheless an important decision. And suddenly everyone was talking about ECDIS. Companies started drawing plans for implementation. Seafarers rushed to complete the general ECDIS course. All the way the talk was about ECDIS. Initially most of us thought that we can learn each aspect of ECDIS through ECDIS course. But ask any seafarer if they were satisfied with ECDIS course, I am willing to bet that answer would be NO. 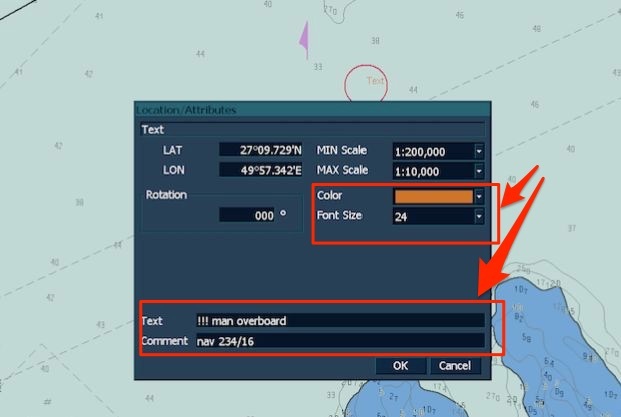 The one area that ECDIS did not cover in details is the correction of ENCs. For example, the word “AIO” did not appear even once during the ECDIS training. Another issue with ECDIS was that most of us thought ECDIS would reduce some of the work for ship staff. We were sure that now the correction would mean a simple click. Some of us went further thinking that correction will all be online and we dont even need a single click. The fairytale thinking ended when we started using ECDIS. There was more to just a single click. And more and more ships are getting detained due to lack of knowledge of operating ECDIS. This post will try to fill that gap. We will discuss how we should correct the ENCs for navigational warnings. We all know how to deal with nav warnings on paper charts. While the principle of handling the nav warnings remains the same, plotting the nav warnings on ENCs is somewhat different. 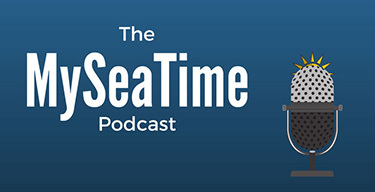 The first thing that we need to address is which nav area warnings we need to plot on ECDIS ? On paper charts it is different matter all together. Oil majors expects us to plot nav warnings on the voyage charts even if the nav warning is 200 miles away from our planned course. But on ECDIS all the ENCs are seamless. We dont change the chart manually like we do for paper chart. So how do we decide, which nav warning we need to plot. Well we dont plot the nav warnings just to keep PSC or oil major inspectors happy. 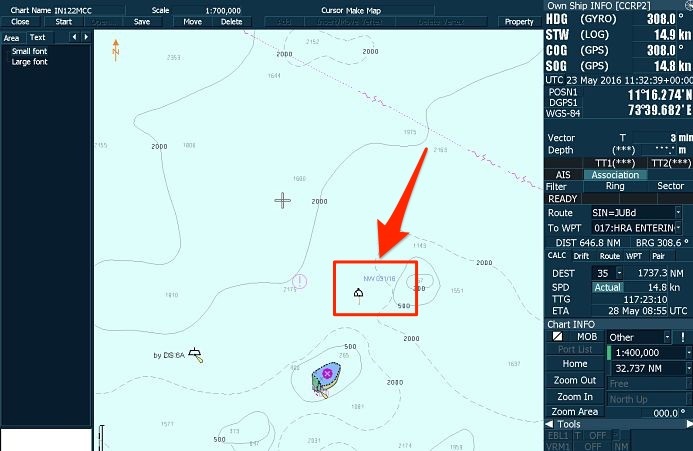 We plot the nav warnings to ensure that vessel is always sailing in safe areas. Keeping this outcome in mind, we should decide upon a maximum distance from our planned course below which any nav warning need to plotted. 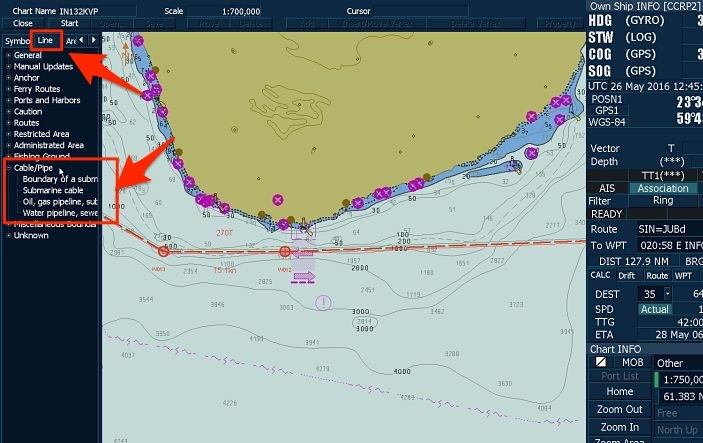 In fact, I strongly believe that company should set this distance as guidelines in Navigation guidelines for plotting nav warnings on ECDIS. I prefer distance of 100 NM. Any nav warning within 100 NM of our planned route should be plotted. You can set your own reference distance. But you should be able to convince everyone that in case the route is changed for any reason, you will be able to get and plot the nav area warning before reaching that area. But you should not be very rigid with the set distance. 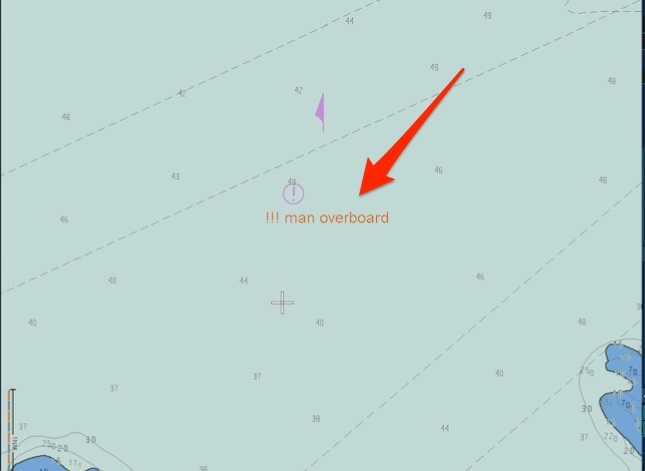 For example you should consider plotting the nav warnings like “Man overboard” even if it is more than 100NM from your planned course. 1) A single point Nav warnings. These are the nav warning requiring to plot on a single position. 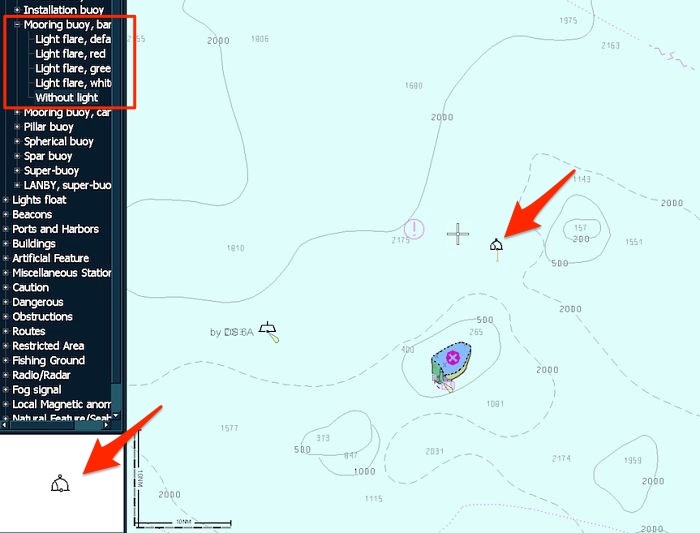 Nav warning with information of a wreck, a buoy, platform etc are few of the examples. These are the nav warnings that affects an area on the chart. Firing practices, Survey operation in an area are few of the examples. These are the warnings which affects along a single ot multiple lines. For example, laying of submarine cable. These are the nav warnings with just some information. Man overboard or a missing buoy are few of the examples. I hope you would understand that not all the nav warnings can fall under these four categories. But those Nav warnings can be dealt with the way at least one of these four Nav warnings are dealt. 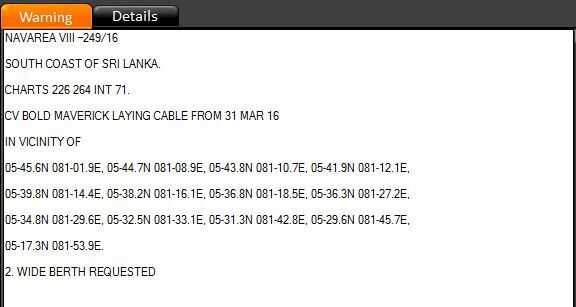 Lets see how these warnings can be plotted on ECDIS. We would plot this on JRC ECDIS but process will be similar on other equipments as well. We have to try to not clutter the ENC. The information should be readily available and should not require too many clicks by the OOW to view nav warning. The information should be clear on all the ENC scales the nav warning is applicable. For plotting anything on ENC we need to use manual update option and not user map. User map is to be used for passage planning like drawing parallel indexing etc. As I said these are the warnings plotted on a single position (point). The nav warning I have taken as an example is the actual nav warning for area 8. Below is the actual warning. Lets plot it on JRC ECDIS. Go to chart > Manual update > Click on start > click anywhere on the ENC you wish to plot this nav warning. It will give a message that ENC has been selected. Next we choose the mooring buoy option from the left menu. The preview of the symbol will be visible on the bottom left corner for the symbol we select. just left click anywhere on the ENC. This will plot the buoy and then right click on the buoy and choose ‘Enter Lat/Long” or “property”. I prefer the 2nd option because whatever option we choose we have to go to property option to enter other details. 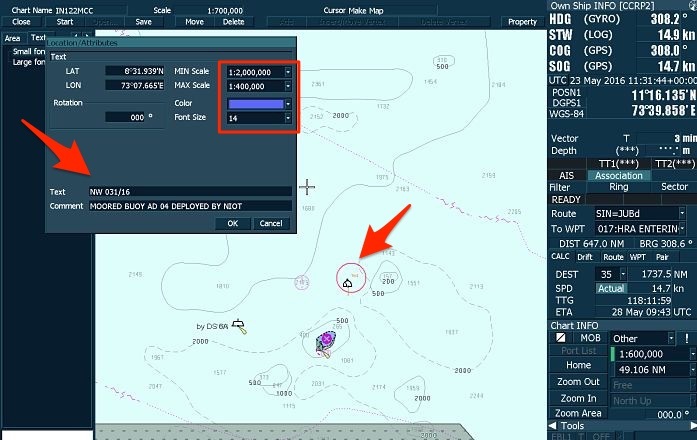 When in “property” option, enter the Lat/Long of the buoy as given in nav warning. Choose the minimum and maximum scale. 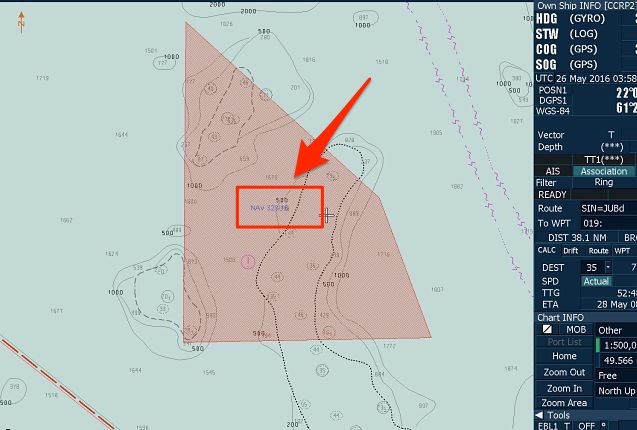 Enter the comments like in this warning we can enter “Nav 031/16 Moored buoy AD04 Deployed by NIOT”. The comment we enter here will not be visible on the ENC. This will be visible when we go to other information of the buoy. Choosing a minimum and maximum scale is important. Whatever values you set, the nav warning will be visible on between those scales only. 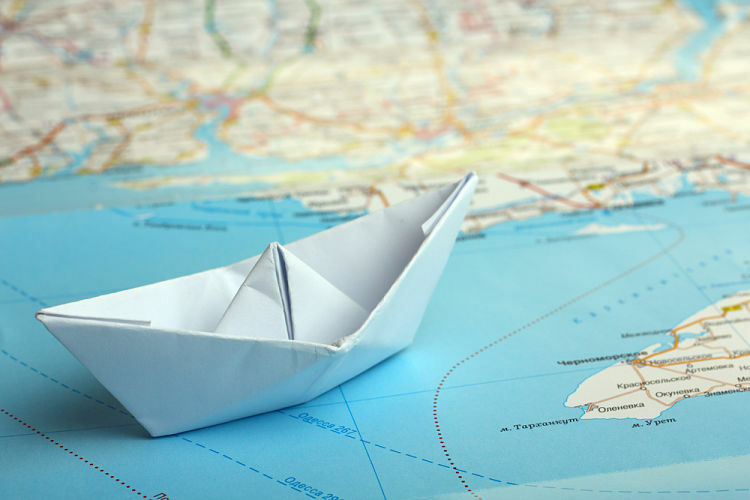 You should set the minimum scale as the minimum scale ENC available for the voyage. For the maximum scale, you should use your professional judgement. For example, for dangerous wrecks you may want to show it over wide range of scale. A non-dangerous wreck can be shown only on large scale and 2-3 scale over it. Another example. A buoy in mid sea can be show over wide range of scales. We may show a buoy inside a channel only on large scale. So now we have plotted the buoy. Now we need to write nav warning number near to the buoy. There are two way we can do that. Choose the max/Min scale same as what was entered for the buoy. In the text write the nav warning number like “Nav 031/16″ or “NW 031/16″. In the comment you can write short description of nav warning, though it is not necessary. Choose the font color and size and click OK. If you wish to change the font size/color, right click and choose property and click on the text. The same location/Attribute window will open again and you can change the data. Once done, Click the Save tab on the top bar. Once the it is saved, you cannot edit the nav warning. if you need to edit it, you need to delete the nav warning and then plot again. 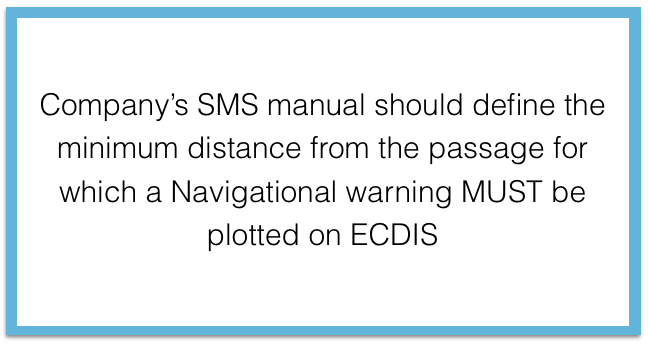 So you have now plotted this Nav warning on ECDIS. To plot this, again follow same procedure to choose the cell on which to plot the warning. Click start and this time choose “warning area” under “area tab” from the options in the left menu bar. Right click anywhere on the ENC and enter the first position of the area to plot. Keep on entering all the positions and then at last enter the first position again to have the ends meet. To finish entering the position of the area, click on “property” on the top bar. Now you can see the warning area plotted on the ENC. Now we need to add information as to what activities are going on in this area. To do that, right click > choose Property > click anywhere in the area. This will show the Location/Attribute pop up. Enter all the information, choose min/Max scale. Choose transparency as 75% so that you are able to see the ENC information below warning area clearly. 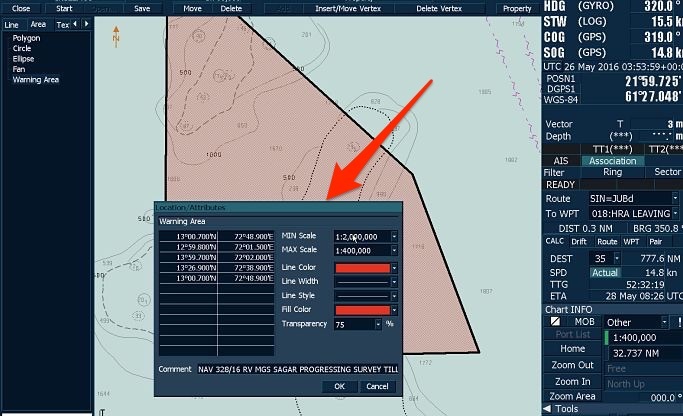 And finally write the information about the activities in this area in the comment and click OK.
Now the nav warning has been plotted and we need to do last thing which we have to do for all nav warnings plotted on ECDIS. That is writing the nav warning number so that the source of this manual update is easily identified. So go ahead and write the text “NW 329/16″ as we did for the previous warning. 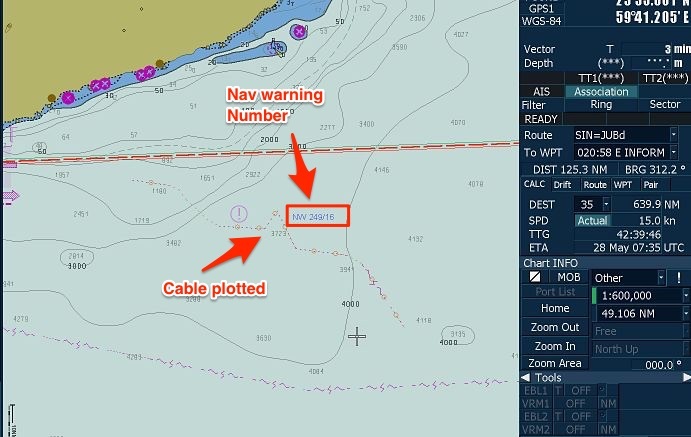 These type of warnings mostly include cable laying along a line. Below is one such example. Lets plot it. Now from the chart symbol option on the left choose cable/pipe under Line section. Right click anywhere in the chart and enter first position of the pipeline. Right click anywhere in the chart and enter first position of the pipeline. Keep on entering all the positions of the nav warnings and then click on property on top menu to finish entering the positions. Now again we need to write the description of the activity in the nav warning. Right click and choose “Property” and click anywhere on the plotted cable. Choose Min/Max scale and enter the nav warning description in the comment. Now you need to enter the nav warning number as text near to the cable so that we know this is plotted as a nav warning update. This will help in finding the nav warning when we have to delete this at later stage (when nav warning is cancelled). Go ahead and write the text as we did earlier. To finish, just click the Save tab on the top bar. These are the Nav warnings containing just information. For example, a buoy missing or Man overboard. 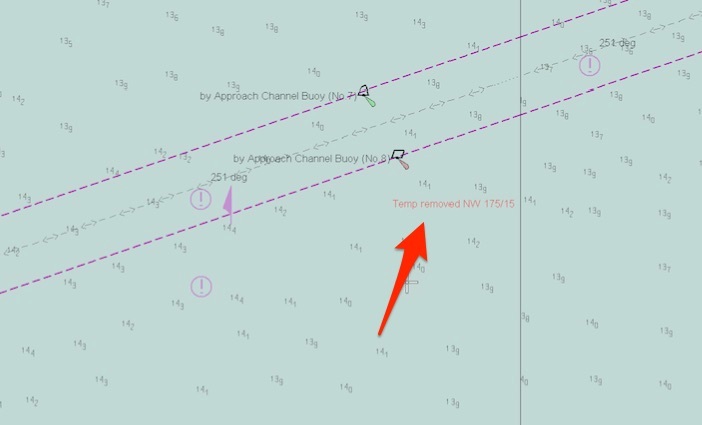 Below is an example of such nav warning where as a buoy has been temporarily removed. We can either place a “information” sign near to the buoy and write the information in that or we can write the text near to the buoy. I prefer writing the text near to the buoy because this way information is easily available to the navigators. So to plot this warning, we just write the text adjacent to the buoy. While plotting these type of navigational warnings, it is important that you keep in mind the level of urgency in the nav warning. 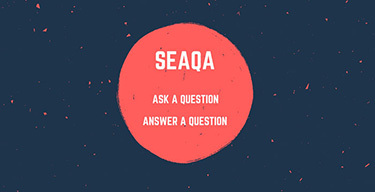 Depending on the level of urgency, you can choose the font size and/or color of the text. 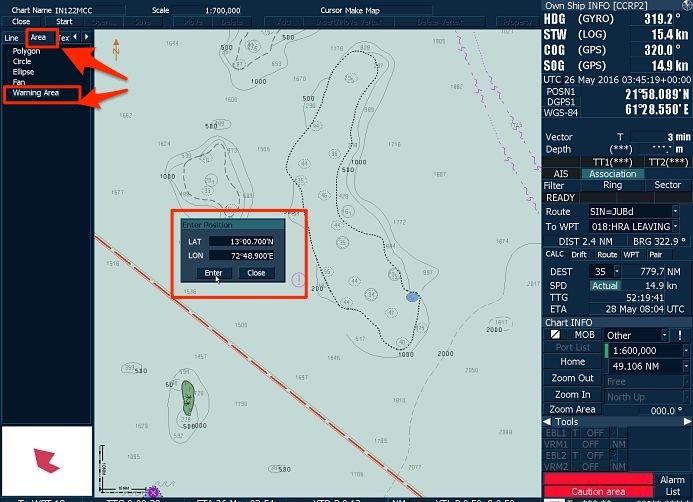 For example for a nav warning with an information of “Man Overboard” need to be with bigger font and prominent color. I would even recommend the use of exclamation marks to draw the attention of navigator for the important warnings like this. 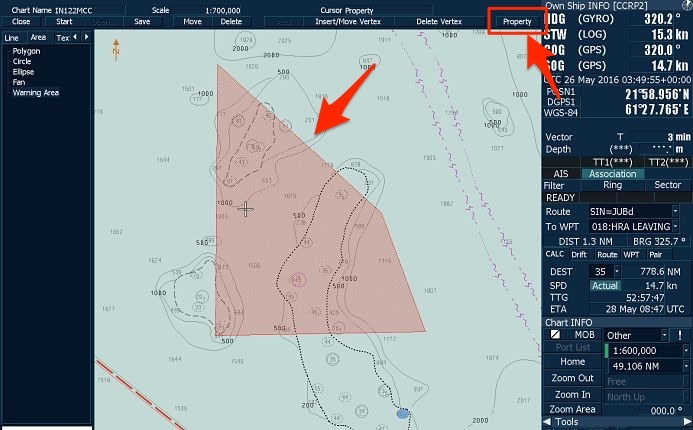 Handling Nav warnings on ECDIS is no different than handling nav warnings on paper charts. But the main principle of nav warnings on ECDIS and paper charts is the same. And that is to have a system where no nav warning is missed and no cancelled nav warnings is on chart. On nav warning print out we write the chart number on which this nav warning is plotted. Same way we need to write the ENC cell number on which the nav warning is plotted. On paper chart, for the plotted nav warning we write the nav warning number at the bottom of the chart. There is no bottom of the chart in ENC. So we need to have a log where we can write the warning number against the ENC on which it has been plotted. The log could look something like this. In fact we should have similar kind of log for navtex warnings and T&P notices plotted on ECDIS as well. 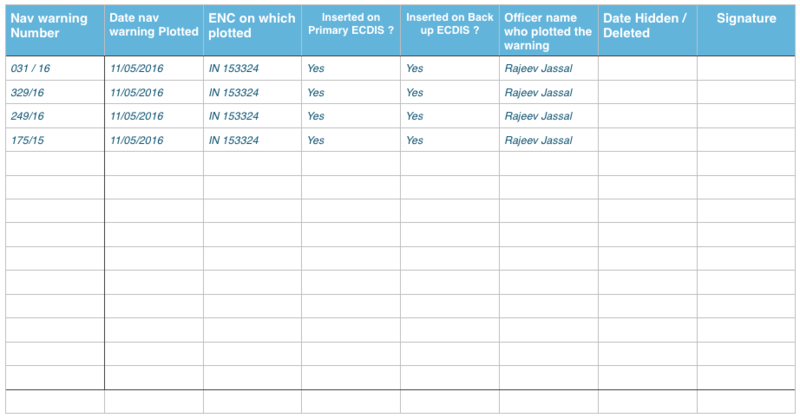 After deleting a warning on ECDIS we need to update this log. We all know how important navigational warnings are. These are the informations which affects our voyage NOW. These are the most current informations and need to be taken very seriously. While the digital world has touched the universe, it is irony that we still need to plot the nav warning manually. There is some work going on in digitisation of these nav warnings but till that time we need to know how to plot nav warnings on ECDIS. But lack of user oriented information on handling these warnings on ECDIS is a serious concern. This concern can only be dealt with logical thinking while setting up procedures of handling nav warnings on ECDIS. Nicely done, very helpfull article expecially for JRC users. Although I would like to share my oppinion regarding this manual correction vs the user map option. First of all editing over the cell itself is not very applicable for noobs. Isn't it easier to create several user maps for the different navareas and to safely apply corrections there. Having in mind that JRC have no limit for overlapping of user maps and for the amuount of user maps that you can create. Let us say that you have 2 inmarsat C on board we can monitor the next navarea lets say 1 day before and we can be ready in advance for the future navigational conditions. Another consideration that I have is what will happen if we maka a manual correction and we dont erase it and after some time we get the weekly update? If tye correction is already included in the update as a permanent one, what will happen with the manual one that we made already? I am not so advanced so if somebody can answer me I would appreciate it. Using user map we can avoid that. We can just erase the whole usermap with everthing in it assuming that we dont need it. We have to be sure that we have choosen the correct usermap before making the correction itself and to be careful not to merge some usermaps by mistake. Hi Sava.. 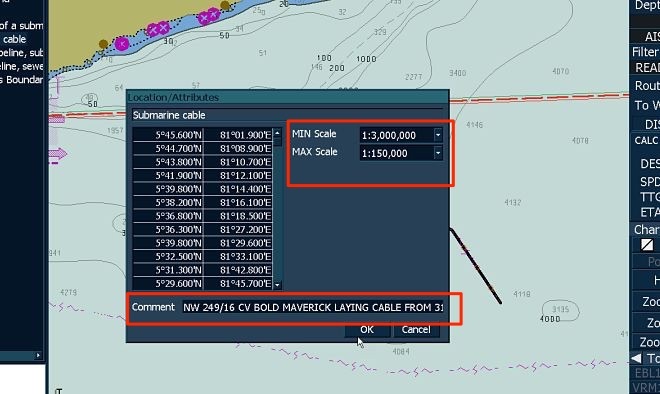 The problem with User map is that it only has the options to draw figures like Line, circle, rectangle etc and not the chart symbols like buoy, submarine cable. So if you need to draw submarine cable, you won't be able to do that with user Map. Regarding your 2nd query, We need to cancel a navarea warning when one is cancelled and not when it is included as permanent correction. We need to have a log of what all navarea warnings we have plotted and on receiving the weekly in force list, we need to delete the one that are cancelled in that week. Thanks for the explanation sir. Is there any oil major rule that states that warnings are to be plotted only using manual corrections?... Because not all warnings come into those four categories what you have mentioned. In that case usermap comes handy. Sir..This was a very helpful blog..and ive been searching for a similar guidance for quite some time..we used usermaps previously for the purpose of nav area warnings...like the way Mr.Sava mentioned...making usermaps for various navareas nd so on...It was easy in many ways..U didnot have to physically navigate to the particular position or to chart for entering the correction...instead create the symbol on your wrking screen type in the location and the object will go to the designated area...also it was possible to share usermaps between ecdis ..so if you do update on one you could transfer it to other and both ecdis would look precisely the same....even with texts and informations coming at same positions..But these days sire inspectors are advising that the navwarnings and t nd ps should generate alarm the same way as ecdis does with normal enc....which again cant be done with usermaps..One suggestion was creating all warnings with dangermark and danger area but i guess that is not the way to go about it...Well lets take no shortcuts and of this is the rightway...lets do it the rightway....I still have a few doubts regarding manual update....One is..if it is a long pipeline being layed...like the one from singapore to all the way up in china....which chart should we select for doing the update...at times the coordinates of joining points itself lies on different charts...when i went throigh a guidance by iho..it says updates which lie outside cell range should not be accepted ...Sir could you please advice on this...it would be a great help..I also got to know that some explanations are given in IEC 61174....However I couldnt find a copy of it as it is not available for free download...Kindly advice..
Hello sir, understood on plotting but how to remove the same plotted bouy or some other cable?? For those who are upgrading to PL4.0 I want to warn regarding using "Manual Correction". From PL4.0 Manual Correction works only on chosen chart, it means if you plot on Large scale chart it will not be seen on bigger scale chart and other way around - as ther in more chose of min/max scale. Also After upgrade of Present system there is big Chance that you will get stuck (PL 4.0 DONT LET YOU HIDE (DELETE) CORRECTION DONE ON OLD SYSTEM) with Manual Corrections which was done on 3.4. as the PL4.0 uses other way of saving Manual corrections. Of course there is way how to remove thous Manual Correction from old system (its in UCHA folder with other extension, so if you go ECDIS DATA folder and UCHA Folder you can delete it manually). Any how Before upgrading I advise to remove All Manual Correction. Also from PL4.0 it looks like NAVAREA is more comfortable to put thru User Map. That was such a precious information. Thank you captain Jassal. Your knowledge is really valuable and helpful for plenty officers.